Learning to thrive within our means. My Mcintosh Turned 30 Today! Can it be possible? The Apple Macintosh turned 30 years old today! I bought it when I was going on 30 years old, so, perhaps you can understand why I am nostalgic and a bit surprised. If you watched Super Bowl XVIII between the Washington Redskins and the Los Angeles Raiders, you would have seen a boring game and one of the most compelling commercials of all time, directed by Ridley Scott, who also directed my favorite dystopian film, Blade Runner, in 1982. The commercial ended with, "On January 24th, Apple Computer will introduce Macintosh. And you will see why 1984 won't be like '1984.'" Referring, of course, to the George Orwell classic, 1984. What you see pictured above is my vintage 1984 Macintosh, which is still working like it did in 1984. Note the instruction manual showing how to use a mouse. It was a new invention then. Note the fonts on the screen, which had a white background, like a sheet of paper. I have since replaced it with multiple models, but I kept it because it changed everything in the tech world, which I was immersed in at the time, and I used it at a time in my midlife when everything was changing for me. Macintosh was my tool of choice for writing weekly newspaper and monthly magazine columns and it accompanied me to architecture school where I used it to illustrate an architecture book about Frank Lloyd Wright's formal language for one of my professors and edit the nation's first monthly sustainable architecture publications for architecture students. I purchased it with the proceeds from teaching beginner computer classes and royalties from my 1984 book, Personal Computers: A Complete Handbook for Beginners. The Macintosh cost $2495 in 1984 dollars and, to do any serious work, you also needed the hard drive and the equally expensive Apple dot-matrix printer. So for $5000 you could have a serviceable home computer set-up. Pundits of the day thought this was crazy when IBM PCs were less expensive. But PCs lacked the graphical interface, the type fonts, the mouse, and so many other cool things that I HAD to have. For that investment, you got 128 kilobyte RAM, no wireless, no Internet. By contrast, my latest computer has 125 times more RAM for less than half the cost and my phone has 5000 times more storage and is connected to everything everywhere. I was doing some consulting on the side for a law firm at the time and one of the partners asked about investing in Apple stock, which was at $18 per share. I said BUY! He did. I didn't. As I recall, my lawyer friend bragged about selling his 1,000 shares later at $64 per share for a gain of $46,000. APPL was down today to $546 per share. You do the math. Perhaps he should have held onto it. If he asks me again, my answer will be the same. BUY! My Macintosh now sits on a shelf in my basement family room alongside my mother's Underwood typewriter, which also still works. Above it is a Kenwood stereo receiver purchased in 1976, which also still works - blasting through a couple of heavy Pioneer speakers of the same vintage, with an analog quality that is difficult to replicate today. I decided to switch the Kenwood on as I write this to play the top hit from January 1984: Owner of a Lonely Heart - by YES. Of course, I could have just called up iTunes or Pandora on my current iMac, but there's something about vintage electronics that appeals to me. Perhaps that is due to my vintage and my childhood memories of Dad's man cave filled with glowing tubes of radios and oscilloscopes. Thirty years is a very long time, but it seems like only YESterday. Winter storm Euclid dumped nearly a foot of snow in my neighborhood on Wednesday, December 26, and I thought it would be fun to try to make it into the closed Indiana University campus about three miles away to get some photos during the blizzard. Much to my wife's chagrin, I decided to take my mountain bike, since my driveway and street were impassable. I assumed, correctly, that High Street would be plowed and my bike would get me there. The streets were deserted, as was campus. Wimbleton Lane before the plows. My mailbox on the left. Hoagy Carmichael keeps at the piano during the storm. Jordan River in front of the Indiana Memorial Union. Herman B Wells watches over Maxwell Hall and the Student Building. A view of a deserted Kirkwood Avenue beyond Sample Gates. 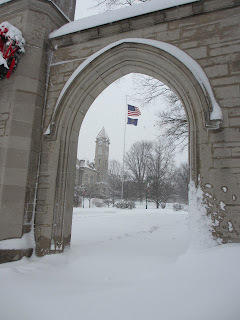 The Student Building through the Sample Gates. As scientists continue to reveal new evidence of the declining state of the biophysical systems upon which we depend for our existence, the nightly news seems to reinforce the consequences of these findings. We witness an almost daily stream of bulletins about record drought, heat waves, wild fires, extreme storms, floods, extinctions, and evidence of oceans more degraded than previously thought. 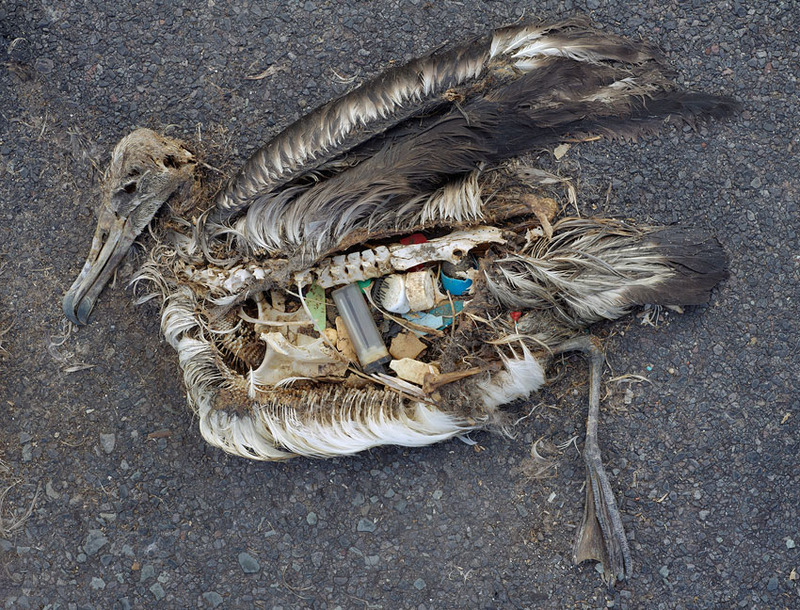 This knowledge of environmental degradation can lead to feelings of fear, sadness, grief and despair. Artist Chris Jordan deals with his eco-despair through his art in several journeys to Midway Island to document the effect of plastics on the albatross, but also to witness a place of great natural beauty. Don't miss his Midway Project. Positive action, going forward, according to Gilding, is the antidote to despair and the pathway to solving the problems we face. By moving forward, we are not immobilized by feelings of grief or powerlessness. By moving forward, we don’t slide back into denial or apathy or numbness. We engage. Part of my job involves working with 18 student sustainability interns on initiatives they lead in collaboration with various university departments and community agencies. Each has an academic mentor to guide their scientific research and each also has an operational mentor to assist with implementation of their solution on campus or in the community. Some do express feelings of fear, anger, despair and frustration with the pace of the mankind’s response to these urgent challenges. Those are the ones who understand the depth and breadth of the response that will be required to turn destruction into regeneration. Those are the ones who end up going forward and they take all of us with them. We are recruiting the next class of sustainability interns this month, from scores of qualified applicants. They will be challenged with large, complex problems and they will find their way through. Keep an eye out for them. In them behold the antidote to despair and a reservoir of hope for our collective future, moving forward. A mountain goat ten feet away looks up at me with curious eyes and tilted head, as if to ask, “what are you doing up here?” Behind him the horizon recedes to infinity beyond Lake McDonald, 3,300 feet below. We stand together atop Lincoln Pass in Glacier National Park, sharing a spectacular panoramic view of the Whitefish Range. My morning hike began at the historic Sperry Chalet, a rustic stone compound that was finally opened for the summer season the day before. It had been nearly scraped off its lofty perch on Gunsight Mountain by a winter avalanche that swept an adjacent pine grove into oblivion with unimaginable force. Fresh grizzly tracks in the snow next to mine -- perhaps left by the mother bear and her cubs spotted in the area the day before -- enhance my ability to see, hear, and smell. Every hair is on full alert. My heart and lungs labor in the high altitude. Warm sunshine takes the chill out of the breeze coming off the snowpack. Distant waterfalls, fed by hanging lakes and rapidly melting snow, whisper a background track for the bright songs of alpine sparrows and finches. Clumps of brilliant green and yellow glacier lilies push up through the snow at my feet. No AT&T bars exist here to imprison my mind with unimportant emergencies and unnecessary information. Spared from breaking news, email, texts, and phone calls for the past few days, my mind is clear, relaxed and focused. My surefooted companion scampers easily where I have to tread clumsily with crampons and ski poles to avoid sliding down the snowfields. His cloven hooves, evolved to spread apart and grip the snow, serve him well as he frolics in his realm without a care. My eyes soak in a scene with infinite detail at all scales, from the luminous fractal lichens on the rocks in front of me to the layered colors of mountain ranges rolling out like waves in the distance. Some are painted with the brilliant golden light of the morning sun, while others are gently caressed by the shadows of watercolor clouds. How many thousand millennia have passed in the making of this glorious scene? No photo could ever capture the grandeur and abundance of this view. I could stand here for a lifetime and not see it all and I know it will change in the next moment. The last shuttle, the 1985-model Atlantis, is preparing to end an era of manned space flight when it glides back to Kennedy Space Center on July 20. 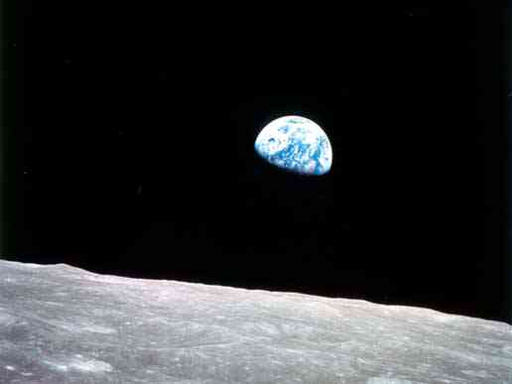 Remembering the space program that grew up with my generation, I am drawn back to Christmas Eve 1968, when millions of us were glued to TV sets to watch the first humans to leave Earth’s orbit attempt to enter lunar orbit over two-hundred-million miles away aboard Apollo 8. We Earthlings were ready for some good news. The long and divisive war in Vietnam had taken a nasty turn with the Tet Offensive. Assassinations of Martin Luther King and Robert Kennedy shocked our spirits. Soviet tanks put down Prague’s move toward democracy. This was a year when we were at our worst, but we still hoped for the best. Miscalculation of complex maneuvers to leave earth orbit and later enter lunar orbit would either create another lunar crater or catapult Apollo 8 on an endless orbit around the sun. Using computing power comparable to today’s pocket calculators along with a sextant, the crew, consisting of Jim Lovell, Bill Anders, and Frank Borman, attempted to maneuver their tiny craft into position with timed rocket and thruster burns while we watched and listened. The critical burn was made on the dark side of the moon where radio signals could not reach. It was one of the most agonizing periods of silence ever broadcast. Millions exhaled in simultaneous cheers when the crew finally resumed contact, precisely where they needed to be. Astronaut Bill Anders loaded a handheld Hasselblad with color film and snapped an image that is forever stuck in our collective psyche; a lonely blue planet rising above the cratered gray surface against the black background of space. One space capsule took a photo of another space capsule. Both were equipped with limited capacity to support life in the hostile vacuum. One was designed to do so for 147 hours; the other for eons. One had a fixed number of three passengers; the other had 3.5 billion, which will double to 7 billion sometime this summer. As the shuttle program ends, perhaps it is time to turn our attention to the lonely blue mother ship in that 1968 image. Another 75 million souls climb aboard each year. The gauges show the temperature is rising. Water, food, and fuel limits are becoming increasingly apparent. The O-rings and the heat shields are showing some damage. We get one chance for a course correction and it happens on our watch. While we still have a choice, will we choose our worst, or will we choose to be our best? What is the Most Deadly Disaster Likely to Strike Indianapolis? What is the most deadly natural disaster likely to strike Indianapolis? Perhaps an EF5 tornado? In a few minutes on May 23, the nation’s deadliest tornado since 1947 cut a six-mile path of destruction through Joplin, Missouri, killing 151 and causing over $3 billion in damages. Maybe the New Madrid fault will roar back to life resulting in a major Indy earthquake? Johnson defined an extreme heat event, commonly called a “heat wave,” as a period of prolonged high ambient air temperature coupled with high humidity. In a typical year, extreme heat is the number one cause of weather-related death in North America, outpacing all other causes combined. Famous recent extreme heat events include the Chicago heat wave of 1995 that killed more than 600 residents and prompted that city to take action. A European heat event in 2003 claimed over 40,000 lives and a Russian heat event last summer killed 56,000. A major factor in extreme heat events is the urban heat island effect, where heavily developed areas tend to be considerably hotter than the surrounding countryside, due primarily to absorption of heat by dark, heat-absorbing roofs and dark paved surfaces. In the country, vegetation creates shade and transpires moisture for natural cooling. Other factors have to do with slow-moving weather systems and domes of stagnant air with high ground-level ozone pollution. The Chicago extreme heat event of 1995 overtaxed the Chicago region’s electrical grid, causing brownouts and blackouts that shut down air conditioners and fans. People living in dense urban environments may be more vulnerable to extreme heat if they also lack access to transportation or air conditioning or if they have illnesses or other risk factors. Risks increase for the very young and very old and for people who live alone. Part of Johnson’s research is to map these “socially vulnerable” populations in relation to urban hot spots to show areas of greatest risk of mortality. This type of mapping can be used to target areas for mitigation of the urban heat island effect and to inform emergency planning for socially vulnerable populations. Johnson predicted an increase in the frequency of extreme heat events, due to climate change, the most direct effect of which is increased heat. Scientists at Stanford reinforced that prediction this week announcing research that suggests permanently hotter summers are on the way. A 2007 study (PDF) by the Pew Center on Global Climate Change found a similar connection between climate change and increasing frequency and severity of heat waves in the Midwest. 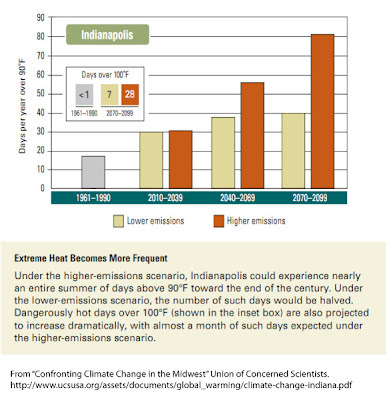 The Union of Concerned Scientists published a report (PDF) in 2009 with implications for the Midwest with continued warming under various emissions scenarios, including an analysis for Indianapolis (see graph below). 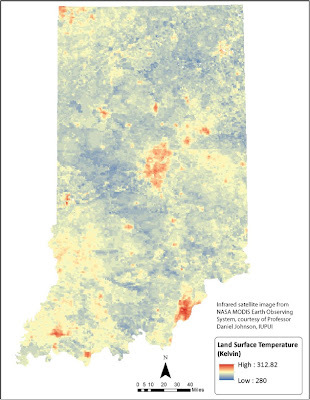 Extreme heat events are particularly problematic in temperate climates, such as Indiana, where the population may not be acclimated to heat, especially earlier in the summer. As if to reinforce Johnson’s presentation, one of those early season events occurred this week when Minneapolis set a record of 103 degrees, causing I-95 to buckle in nine locations. Twenty-five other cities reported record highs. Fortunately, this week’s event was cut short by a cold front. 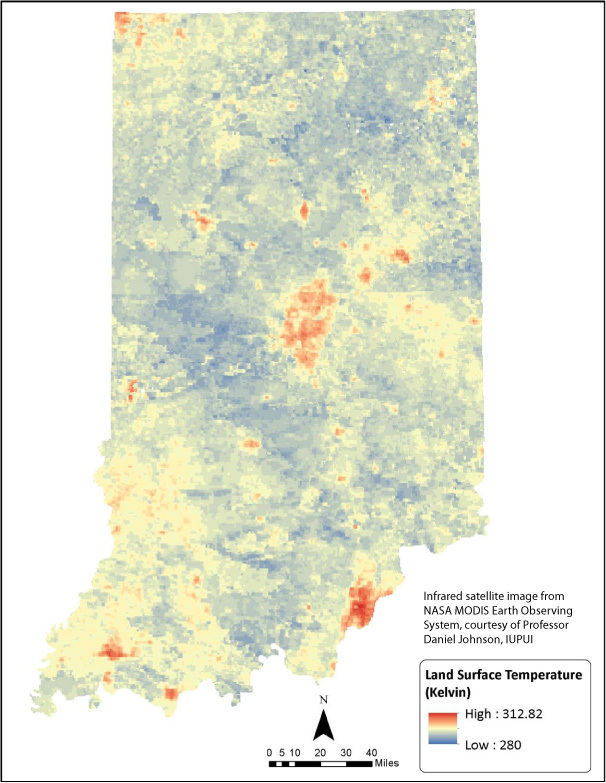 Johnson showed maps of Indianapolis with areas of increasing heat island effects as urban sprawl spread over the past few decades, but the maps also showed areas where the effect had been reversed in neighborhoods with aggressive tree planting programs. Other mitigation strategies for the urban heat island effect include using heat reflective or vegetated roofs, shading paved areas, using light-colored paving and preserving or restoring open space. In addition to potentially saving lives, urban heat island mitigation can also conserve energy and water, clean the air, and make cities more beautiful and livable. These urban heat island mitigation strategies will be like rearranging the deck chairs on the Titanic, however, unless we begin to reduce greenhouse gas emissions dramatically. In the future, it may no longer be accurate to refer to extreme heat events as "natural" disasters. May 25, 2011, will be remembered in Bloomington for seven tornado warnings, one tornado and hundreds of toppled trees. Watching radar, listening for sirens, and heading for the basement were part of the routine here. Thirteen tornadoes touched down in Indiana. At one point a line of severe thunderstorms ran the length of the state and each had an associated tornado warning as I watched on RadarScope. Thousands lost power and traffic was snarled the next day due to dead traffic signals and trees strewn across city streets. A tornado touched down on the southwest side of town along Highway 45 and wrecked a mobile home park, among other structures. A linear swath of severe damage went from Walmart at Hwy 45 and Hwy 37 all the way through town and through the IU campus. Amazingly, nobody was killed or critically injured. As I write this, three days later, many still are without electricity. An estimated 300 trees were destroyed on campus and hundreds more have missing limbs. Dunn's Woods, which fills the old quadrangle, was impassable due to fallen trees and limbs. Student Legal Services, across 7th Street from the IMU and Dunn Meadow, took a direct hit, illustrating that street trees with limited room for spreading roots are particularly vulnerable to high winds. This fence at the north side of the tennis courts south of Woodlawn field illustrates the force of the wind, which bent over 2-inch steel support posts. A typical scene looking east from Woodlawn Field jogging path toward Arboretum (note Wells Library in background). While some students who ignored the sirens reported harrowing near misses from falling trees along 10th Street, there were no serious injuries. One Campus Division employee I spoke to, who had been with the university for 32 years, said he had never seen anything like the tree damage this storm wrought. Generally, campus buildings held up well. While not half through, 2011 is already being billed as "The Year of the Tornado." According to the National Oceanic and Atmospheric Administration (NOAA), with records like the most severe thunderstorm wind reports on record (April 4), largest tornado outbreak on record (April 26-28 - which killed 321 people), and most tornadoes in a month (April, 875 tornadoes - previous monthly record for any month was May 2003, with 542 tornadoes). The Joplin EF-5 tornado was the deadliest since 1947 and 2011 overall has seen the most tornado deaths since 1953. For the year, we have had 1,314 tornadoes so far and the record for a year is 1,817, set in 2004. The average year sees 1,274 tornadoes. As the May 25 storms here illustrate, we have much better warning systems in place now than existed 50 years ago. I received a cell phone warning from IU prior to every tornado warning, my iPad and iPhone both gave me push notices from The Weather Channel for every storm, TV and radio stations sounded emergency warnings, and even if all that wireless technology was not working, I could hear all of the sirens. Many of the 132 people who perished in Joplin had warnings but lacked adequate storm shelter for a tornado with 200-plus miles-per-hour winds. If you don't have a basement, it may be worth investigating a simple storm shelter that can be placed in your garage slab or a kevlar and steel above-ground shelter that can be installed in an existing home. Our home in Evansville had an above-ground storm safe room with reinforced concrete floor, walls and ceiling, that also functioned as a spare bedroom during normal weather. Although we have a basement in our Bloomington home, I was missing that comfortable, quiet, secure above-ground room on Wednesday. Our next house will have one.